A crescent is the shape of a moon at or around the first or last quarter. 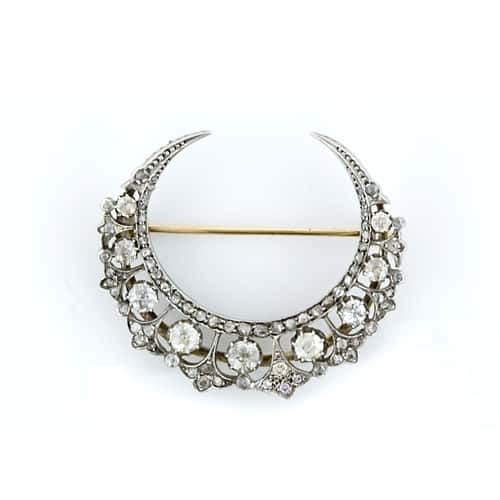 Crescent moons, set with diamonds, were very popular in the late 18th and 19th century as brooches and hair ornaments. When worn as a hair ornament, the crescent moon is associated with the virgin Goddess Diana, one of the twelve deities associated with the pantheon of Greek Gods and Goddesses residing on Olympus. The same figure was worshiped by the Romans as Luna, the Moon Goddess.